*At Stardom, Thunder Rock consisting of Io Shirai, 25, and Mayu Iwatani, 22, won the Goddess of Stardom Tag League 2015 in Tokyo, Japan on November 8. The duo defeated Santana Garrett, 27, and Hiroyo Matsumoto, 30, in the finals in a match that went just over 14 minutes. Shirai and Iwatani have each won a tournament in the past, but this is Thunder Rock’s first joint tournament win. *NJPW Power Struggle 2015 in Osaka, Japan was headlined by Shinsuke Nakamura, 35, defeating Karl Anderson, 35, to retain the IWGP Intercontinental Championship. Aside from that main event the card was chalked full of young talent including the son of Fit Finaly, 55. At 22 years-old David Finlay was the youngest talent on the card, but far from the only guy in his 20s wrestling that night. Other performers 25 or younger included Jay White, 23, Cody Hall, 24, and Chase Owens, 25. Of these four Hall was the only one who won his match. *Former Ring of Honor (ROH) wrestler Nigel McGuiness, 39, has been headlining shows for Westside Xtreme Wrestling (WXW). Not as a wrestler, but as a special referee in back to back main events featuring young talent on November 7 and November 8. The first show was WXW 15th Anniversary Tour: Prague held in Prague, Czech Republic and featured ATOM and Big Daddy Walter defeating Jurn Simmons, 24, and Karsten Beck, 28. The second show was WXW 15th Anniversary Tour: Magdeburg held in Magdeburg, Saxony-Anhalt, Germany and featured John Klinger, 31, and Tyler Bate defeating Kevin Roadster, 25, and Karsten Beck, 28. *Evan Morris, 23, wrestled for Dynamo Pro Wrestling (DPW) against Ricky Cruz, 35, in Fenton, Missouri on November 7. Cruz put his DPW Heavyweight Championship on the line for the first time against Morris at the DPW November 7, 2015 show in a main event that ended in a no contest. *Trevor Lee, 22, topped the card for AAW: Professional Wrestling Redefined on November 6. At AAW Never Say Die in Merrionette Park, Illinois, Lee went to a time limit draw with Eddie Kingston, 33, in a four way elimination match. Also, in the match were Louis Lyndon, 30, and Silas Young, 35. The bout was held to determine the next challenger for the AAW Heavyweight Championship currently held by Ethan Page, 26. With no clear winner, the main event of the next AAW show, AAW Windy City Classic XI will be triple threat match featuring Page defending against Lee and Kingston. *Tiger Ali, 22, had a busy night at the last 4 Front Wrestling (4FW) show in Saltford, Somerset, England on November 6. Ali first lost a match with rival Saime Sahin for the 4FW Heavyweight Championship. However, the bout ended by disqualification so Ali retained his title. In the main event of the 4FW November 6, 2015 show the two wrestled again, but this time in a tag match. Ali teamed with Italian wrestler, Antonio De Luca, 25, while Sahin tagged with Japanese legend Ultimo Dragon, 48. The faces won to send the fans home happy, but it looks like this may set up Dragon putting over Ali. If this is the case that would be a major rub for the champ. *At Desastre Total Ultraviolento (DTU), Ciclope, 24, defeated Violento Jack , 26, for the DTU Extreme Championship on November 5. The bout was promoted as a rancho de Texas match and headlined DTU Ofrendas Extremas held in Pachuca, Hidalgo, Mexico. 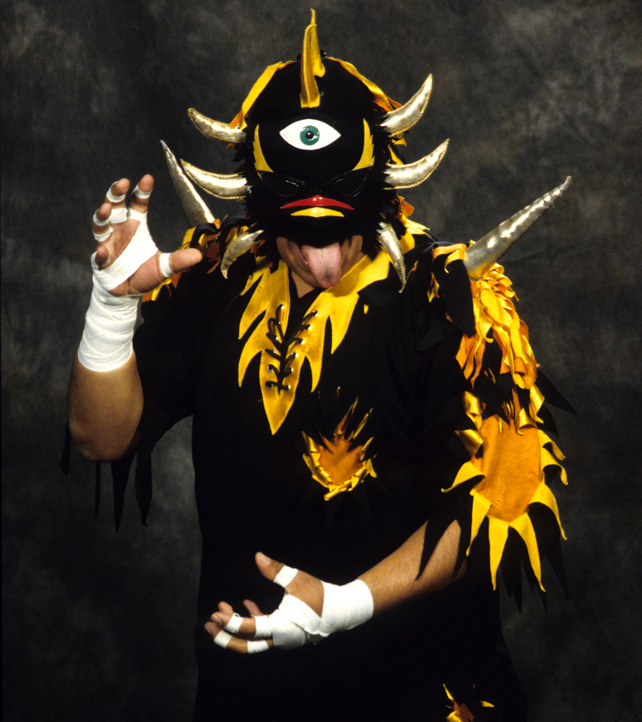 This Ciclope was born in 1991 and should not be confused with the former WCW luchador who looked like this. *Universal Woman’s Pro Wrestling REINA (REINA) crowned a new champion as the REINA World Women’s Championship Tournament ended in Tokyo, Japan on November 3. Kana, 34, vacated the REINA World Women’s Championship on August 31 when she was signed by WWE. She has since left REINA and is currently wrestling under the name Asuka in WWE NXT. At REINA World Women’s Championship Tournament Part 3, the tournament semi-finals and finals were held. Syuri, 26, won the first semi-final by defeating Hanako Nakamori, 26. Tsukasa Fujimoto, 32, won her semi-finals match by defeating Yako Fujigasaki, 18, then went on to defeat Syuri in the finals. This marks Fujimoto’s first reign with the title. *Fujigasaki also wrestled on a Japanese Women’s Pro Wrestling Project (JWP) show in Tokyo, Japan on November 8. Fujigasaki opened JWP The 152nd Dojo Show against 17 year joshi veteran, Kayoko Haruyama, 36, in a performance that went just past 10 minutes. Fujigasaki is on track to wrestle 150 matches throughout her career by the end of the 2015 despite her young age. Fujigasaki debuted for JWP in August 2013 and was trained by Sachie Abe, 41, and Leon, 35. *In more wrestling news from Japan, WRESTLE-1 held the show, WRESTLE-1 Tour 2015: Autumn Bout Night 1 in Nagoya, Japan on November 3. The night featured a title change from a championship that was created by the long defunct Mexican promotion, Universal Wrestling Association (UWA). Jiro Kuroshio, 23, Seiki Yoshioka, 27, and Yasufumi Nakanoue, 29, lost the UWA World Trios Championship to the heel team, REAL DESPERADO. This group is made up of Koji Doi, 25, KAZMA SAKAMOTO, 33, and NOSAWA Rongai, 38. This marks Doi’s first significant championship. Well done, Johnson! I like what you’re doing here with your reports. Thanks much for the updates. Sure thing, thank you for the comment!